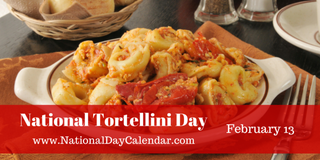 Enjoy your favorite tortellini dish on February 13th, as it is National Tortellini Day. This "unofficial" national food holiday is celebrated each year on this day. Tortellini lovers across the country will make their favorite recipes or order a tortellini dish at their favorite pasta restaurant. Tortellini is a signature dish from the Italian region of Bologna, where they claim to have created these tiny stuffed pastas. Ravioli, tortelloni, and tortellacci are all part of the same family of stuffed pastas. The most common fillings for tortellini are ham, white meat, and Parmesan cheese. An organization called The Learned Order of the Tortellini, in the city of Bologna, has it's members wear to the meetings, red and gold hats that are shaped like tortellini. They also wear a ribbon, around their neck, that has a gold shaped tortellini hanging on it. The Learned Order of the Tortellini has a large membership that is dedicated to the preservation of the traditional tortellini. There are many ways to prepare a tortellini dish. You may want to top it with a cheese sauce, cream sauce, pesto, spaghetti/pasta sauce, or tomato sauce, or follow one of the thousands of recipes available for a great tortellini meal. Four ingredients and 20 minutes are all you need to put a delicious pasta dinner on the table. Much research has failed to find the creator or the origin of National Tortellini Day, an "unofficial" national holiday. National Blame Some one Else Day is always celebrated on the first Friday the 13th of the year. The way to celebrate is self-explanatory in it's name and really not much more needs to be said. If you do not want to blame someone, put the blame on something (remember, it is all in fun!). National Blame Some one Else Day, an "unofficial" national holiday was invented by Anne Moeller of Clio, Michigan in 1982. One day, her alarm clock failed to go off, hence creating a domino effect of bad luck events throughout the day. The day happened to be Friday the 13th.